Who Will Read Our Books When We Are Gone? I am in the middle of what a colleague once called CHOICE card solitary. If you too are working in academic libraries that still receive and share paper copies of CHOICE reviews, you may likely play this game on a regular basis. If you don’t, surely you’ve engaged in the digital equivalent of selecting interesting books to add to your academic library collection. I am super jazzed whenever I come across books like What Works for Women at Work or Money: the Unauthorized Biography. Sometimes I even match up book purchases with potential student research topics or senior theses ideas like some kind of sad game of library book fantasy football. Despite getting caught up in the excitement of buying books (BOOKS!) I often pause to ask myself: Will anyone ever borrow this? Despite my best efforts at predicting circulation trends based on past purchases and faculty recommendations, I know that the sad truth is that most of the books I’m adding to my library’s collection will NOT be read, borrowed, or even touched by students. I am my library’s liaison to the social science departments, and every year the number of senior students who [sheepishly/proudly] declare that they’ve never checked a book out from the library continues to increase. I once had a senior thesis student state that there was no time to read books for this project, as though an academic text needed to be read from cover-to-cover like a novel. It made me realize that for a lot of students, interacting with non-recreational reading books might be a completely foreign experience. I’ve started encouraging students to use our print collection by bringing books to classes where I think they might be critical resources. On more than one occasion I’ve even had students in these classes request those very books! But this kind of small-scale campaign is a drop in the bucket. How can I encourage students in disciplines that rely heavily on scholarly journal articles as primary sources (like psychology) to turn to monographs for critical big-picture readings, background information, and collections of important research? Even more troublesome: How do I get students in disciplines with heavy scholarly book outputs (like political science) to actually use these texts? Yes, a big part of the answer is working with faculty to create assignments or workshops that incorporate books, but how do we highlight books were are purchasing more generally? I understand that one answer to this question is sort of a shut-down: We shouldn’t be buying things students won’t read. 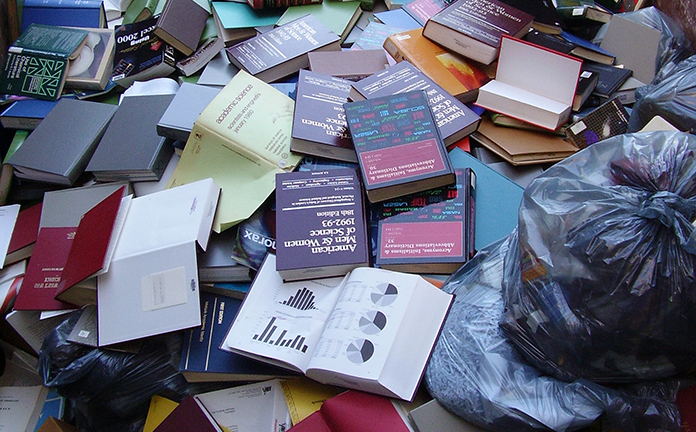 But what happens when that thinking leads to eliminating our print collection altogether, often to the detriment of students’ access to information that would make their research papers and presentations AMAZING? How are students at your library interacting with your book collections? Are you spoon-feeding them veggies books in hopes that they might one day like them? Or are you just leaving them on the plate shelf and hoping they’ll realize they’re awesome? Somewhere in between these two approaches? I’m not a librarian, but work in library acquisitions. Every year maybe two times a year we have major weeding projects for resell. I cringe and a times my heart breaks at the sound of creaks and cracks of a book never opened much less checked out. Money is crucial these days and I don’t have a say in the choice of books purchased, but as the move heads more toward e-books, the stacks are getting dusty and stacks being replaced by computer hubs. Your ideas are excellent. There needs to be a much stronger push from academic librarians to get students back in the stacks. Wow, weeding twice a year is INTENSE, but increasingly necessary. I know I’m trying to do my part to encourage students to use books but would also like more encouragement from departmental faculty. Barbara Fister and colleagues have been starting some interesting work about student attitudes towards ebooks, which is to say, students would rather use print books. (PDF here: http://crl.acrl.org/content/early/2014/05/29/crl14-587.full.pdf). I know this isn’t a real answer to your question, but it’s a line of inquiry that I’m following closely as my library makes decisions about what to do with our (tiny) budget and the books that we purchase and no one reads. As for how to get students to use books, the best way I’ve found so far is just what you’re doing – bring them to class and make students touch the books, particularly when their questions are best answered by a book. Sometimes I think books are just too intimidatingly long, so I try to talk honestly about using books for academic purposes in all my classes. Sometimes a chapter is all you need.